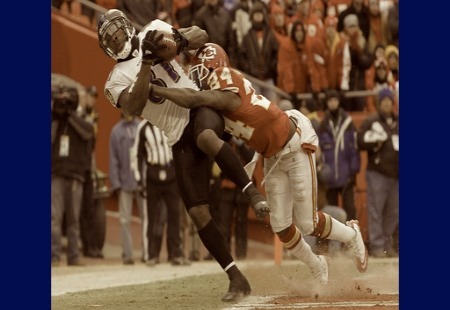 The Ravens, coming off a close win at home versus Cleveland, look to pick up the pace on the road in Kansas City. To make a strong run this year, Baltimore must overcome their inconsistent ways of last year; struggling on the road to teams with losing records. Kansas City is fighting to stay in their divisional race. What looked like a promising year has turned into a troubled start. At 1-3, the team can attribute their three losses to turnovers. Last week the team has six turnovers at home in their loss to San Diego. After four games the team has 15 turnovers (eight fumbles and seven interceptions). In the NFL that just kills your chances. After four games the Ravens rank 13th versus the run (94.5 yards per game). Obviously, you want that number to improve and it should as the new pieces on defense start to gel with learning the defensive schemes. Charles has breakaway speed and given lapses in gap containment, he can jettison to the endzone. The Chiefs run game is ranked 2nd in rushing yards per game (173.5). Charles has 415 total rushing yards on the season, with a 5.8 yard ave. While the run blocking is great for the Chiefs, the pass blocking has struggled. Cassel being sacked 13 times and 4 forced fumble (3 lost) on the season are bad numbers. Outside linebacker’s Courtney Upshaw/Paul Kruger vs. right tackle Eric Winston. Winston struggled last week versus San Diego’s pass rush. The Ravens have been alternating Upshaw and Paul Kruger on both the weak and strong sides of the line. If the Ravens want to start racking up sacks, they need to find pressure off the edge. The Ravens did a nice job slowing down TE Rob Gronkowski in their match-up versus New England. They will have to duplicate the same success this Sunday with Bowe, who leads his team with 25 rec., 342 yards and 3 TD’s. SS Bernard Pollard will be key for containment. Flowers is a good corner and receiver Torrey Smith continues to out run coverages; down the seem with his speed it’s hard for any corner to contain. This might be a game like last Thursday where Smith and Boldin are targeted quite a bit. Anquan Boldin will be up against CB Stanford Routt. OLB Justin Houston hasn’t disappointed since being drafted by the Chiefs in 2011, this year he has 4 sacks to lead his team. The Ravens O-line struggled last week versus Cleveland’s pass rush. OLB Tamba Hali recorded his first sack of the season; in 2011 he finished with 12 sacks and four forced fumbles. The Offensive line must improve protecting Flacco and opening up running lanes for Rice; last week they struggled to do just that. As much as Flacco is putting up great numbers, running back Ray Rice has to be successful if this no-huddle approach is to thrive. ‘Play-action pass’ has been an effective weapon for Flacco, hence the importance of the run game. Memo to Cam Cameron, the Chiefs rank 20th versus the run (118 yards per contest), they are 13th against the pass (216.0 yards). We should expect Rice to have some solid numbers on Sunday. A few of the losses on the road last year (one this year) has been attributed to abandoning the run too early. It will be interesting to see if Cam Cameron stays patient with the rushing attack.